In Kenya, lions are found mainly in the grassland areas towards the south-west of the country. They live in groups called prides, led by a dominant male. The hunting is usually done by the females of the group. Though their manes make an impressive sight on the grasslands of Kenya, the lion is not the largest of the big cats. The males can reach a size of around 550 lbs, but a full-grown male tiger can tip the scales at 660 lbs. At one time, the lion ranged all through Africa, western Asia, the Middle East. Today, their populations have decreased to only the Sub-Sahara areas of Africa and some of Asia. In Kenya, lions have gone from a population of more than 10,000 to somewhere in the range of only 2,000. Lions are classed as a "vulnerable" species by the International Union for the Conservation of Nature, which is one step below "endangered". Their numbers are declining for namely two reasons. The first is that their habitat is slowly being taken over by humanity. 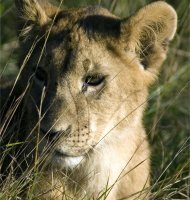 Cities, farms, towns, and roads are breaking up the lion's grassland territory. The second threat is from small farmers who are killing the lions to protect their livestock. Some are shot, but it's becoming more common for farmers to leave out poisoned carcasses to eliminate the lions who kill their cattle. With so many safari parks and wildlife reserves in Kenya, there are a number of places where someone might go to see lions in the wild. The best known for its lion population is the Masai Mara National Reserve. During the wildebeest migration, millions of wildebeest, gazelles and zebras come through the park. And they bring huge numbers of lions, cheetahs and other predators following along behind them. Other parks that are home to Kenya's lion populations are the Samburu National Reserve and the East and West Tsavo National Parks. Lions may be stereotyped as ferocious killers, but they do not often attack humans. There was one particular series incidents in 1898 that remains well-known today. During the construction of the Uganda railway, 2 male lions repeated attacked a construction camp near the Tsavo River. Each night, they would drag men out of their tents and killed them. By the time the lions were finally killed, they had killed at least 28 official Indian workers and possibly a hundred undocumented locals who were also at the camps. The story of the famed "Man-Eaters of Tsavo" was made into a movie called "The Ghost and the Darkness". 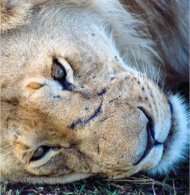 Lions have one other threat that is unique to Kenya, and that is the Masai tribe. The Masai are a nomadic tribe who have mostly resisted any adaptations to "modern" life. The coming-of-age ritual for a young boy to become a warrior, includes the spearing of a male lion. As a test of strength and courage, this tradition is still practiced today and also impacts the overall lion population.